"Conference rooms are spacious and easy to find." 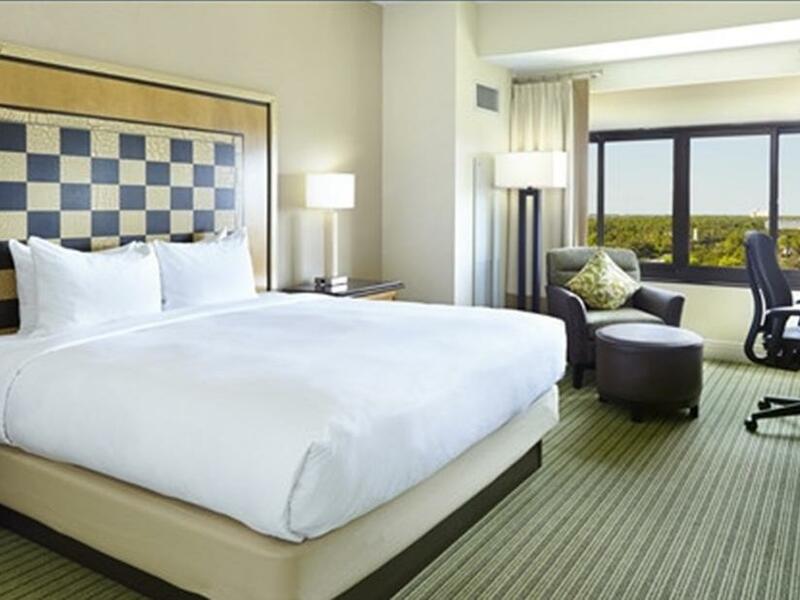 Have a question for Hilton Orlando Lake Buena Vista? 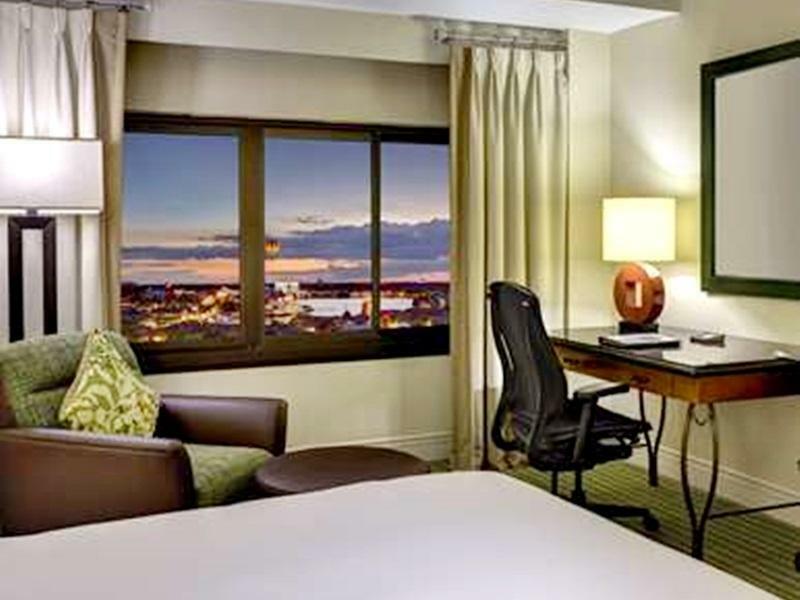 Designed for both business and leisure travel, Hilton Orlando Lake Buena Vista is ideally situated in Disney Downtown Lake Buena Vista; one of the city's most popular locales. Only 15. Km away, this 4-star hotel can be easily accessed from the airport. For those of you who want to venture out, The Art of Disney, The Spice & Tea Exchange, Basin at Downtown Disney Marketplace are just some of the attractions available to visitors. 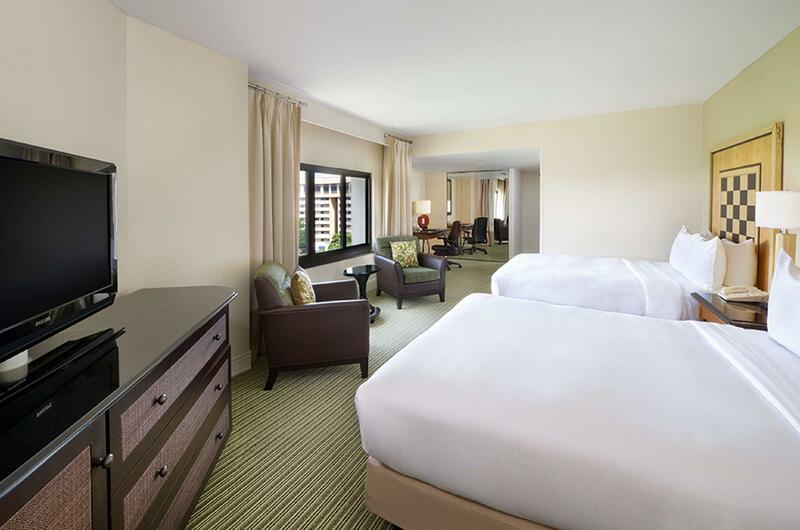 The facilities and services provided by Hilton Orlando Lake Buena Vista ensure a pleasant stay for guests. This hotel offers numerous on-site facilities to satisfy even the most discerning guest. 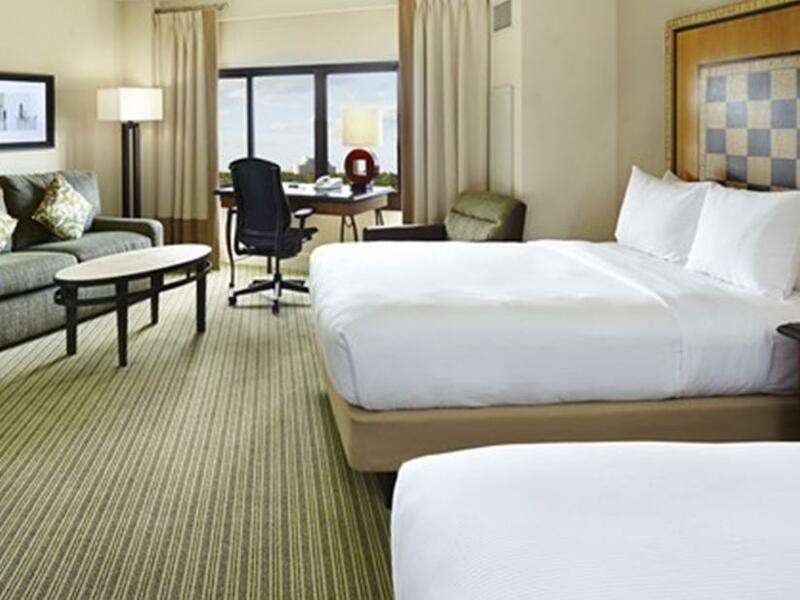 The hotel features 814 beautifully appointed guest rooms, many of which include television LCD/plasma screen, carpeting, clothes rack, linens, mirror. Throughout the day you can enjoy the relaxing atmosphere of the hot tub, fitness center, golf course (within 3 km), outdoor pool, spa. 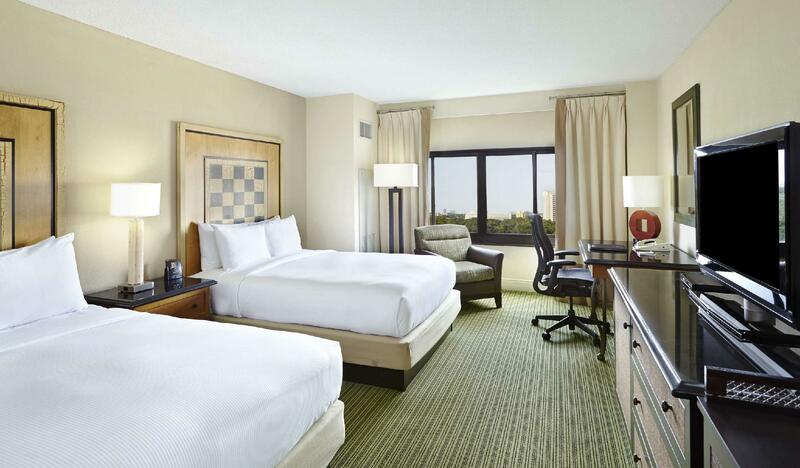 Hilton Orlando Lake Buena Vista is your one-stop destination for quality hotel accommodations in Orlando (FL). Please note that the property provides Valet Parking service at an additional charge of USD 24 excluding tax. The hotel is nice with good location but when I check in they ask for extra and they push you to pay for a useless package that include water, coffee and intert. The room even doesn't has bottle of water or coffee maker. It looks like the lobby and event spaces have been somewhat recently renovated but the room we were in was sorely in need of updating. The chair was ripped, the room smelled musty and the drawers to the dresser and night stand stuck and would not come out easily. The refrigerator barely got cold, so we had to put our food in plastic bags with ice to keep my daughter's food cold (we bring some of her stuff with us as she has food allergies). I'm pretty sure it's supposed to be a smoke free property, but every time we walked through the door from the parking lot, we were met with lingering cigarette smoke. The location is hard to beat, but I would avoid staying there in the future for the reasons above. Flooded room due to extremely poor maintenance which was very clear where they tried to cob it over and over rather than fixing correctly. Mini-fridge in one room died and spoiled all of our meats and cheeses. Staff did not offer to replace or substitute for our loss. Rooms not made until very late in the day. The staff were wonderful in dealing with issues and hiccups. My room wasn't ready for check-in, and there were electrical issues in the bathroom, but staff helped to ensure that I was comfortable and happy while waiting. Conference rooms are spacious and easy to find. WiFi was stable and works throughout most of the hotel (not in conference rooms or pool area). Parking is pricey, but you can park across the street at a neighbouring hotel for 1/3 of the cost. Nice hotel. It's good that there are free shuttle and magic hours (extended hours) provided to DisneyWorld. The shuttle deperts every 30 min from the hotel. The hotel is also close to Disney downtown with shops and restaurants. Free bottled water or Starbucks coffee provided. The room was big and clean, which is very important to me. The hotel was inside disney area so there is a shuttle bus to any disney area every 1 hour. Not near downtown, but we got extra 1 hour for disneyland. We stayed at Hilton Orlando Lake Buena Vista for 5 nights as we were going to Disney and Hilton being a partner hotel, it had shuttle to Disney from before park opening to after park closing (even when Magic Kindom closed at 12midnight). Each guest was also given a beverage voucher for each night of stay which can be used to redeem for either a bottle of water or regular Starbucks coffee. Downtown Disney was also within walking distance (just 5mins from the hotel). However it would be great if there was a hot water flask in the room as we did look forward to drinking warm water after returning from the park in the cold. I was in Orlando for a wedding so I only stayed for a weekend, but I had a lovely time at the Hilton Buena Vista. The room was comfortable and clean. There were some cool treats like free DVDs and the pool was open late which was nice. I also enjoyed the drink tickets they gave me when I checked in for coffee or water which was a nice surprise. The hotel is across the street from Downtown Disney so you don't have to get in your car to grab dinner. We strolled to nearby restaurants with ease. You are walking distance from Pleasure Island as well. We were not traveling with kids so we were pleased to find restaurants with adult atmosphere. I loved Bongos in Pleasure Island in particular. The pool area is nice but not out of this world. Room Service burgers and fries were surprisingly good too. If you are looking for an affordable hotel and don't need a lot of bells and whistles, this is a solid choice. Genrally our stay was good reception staff were great, concierge was helpful to book tours and tickets. The internet (patchy at times though generally good) and Disney transport are included in the Resort fee;as are the coffee/water vouchers and hotel restaurant discounts. Went to use the pool and one of them was closed, which meant sharing the other pool with around 25 children and 10 adults, so I didnt stay there long. Others in my group used the fitness facicites and said they were great. One thing that bothered me was when we requested a taxi and we were given a towncar without being asked if this was okay or told the price - this is the practice at this hotel as they seem to have an arrangement with the towncars (everywhere out of the Disney park will cost a bit in a taxi any way), but we went to the Vineland Premium Outlet, the metered taxi back was significantly cheaper; just make sure you check the price of the towncar or insist on them calling a taxi. The Benihana Resaturant in the hotel is not included in the discount however the food was great, we went there more than once! nice hotel and price was good, until you add the resort fee and parking (together almost an extra per night). for the resort fee you got internet (which i get as a gold hh member, plus water in room and a water or coffee in starbucks each day. i don't drink coffee and didn't get to use all the vouchers. other than that the hotel was very nice and a 3 minute walk to downtown disney. Service was good. The hotel lobby and grounds were impressive. Our room was spacious and the bed was very comfortable. Our only complaint was the over-priced options for breakfast. Otherwise we were very satisfied. It has standard Hilton facility, the staff is really nice and we got early check-in easily even it's not the time yet. As other Hilton hotel problem, the noise is easy to be heard next door, so guests need to be really quiet to make sure did not disturb others. There are free shuttles every half an hour going to all the theme parks, luckily, Hilton is the first stop, so there are always seats as the bus went to all the downtown Disney resort hotels. It's around twenty minutes to Orlando downtown, and actually, better spend the whole week there for the Disney. We spent two days for two parks, really tired tho. This hotel is one of the best looking hotel in downtown Disney area. They have the free shuttle bus to all themes park of Disney. But it is kind of far of Universal Orlando. If you take the taxi will cost you around $30. Walking distance to Downtown Disney, 24hour coffee shop, big bedroom, very clean hotel. This is the only Hilton in the Walt Disney World compound without the Disney price tag. You can get free Extra Magical hour for your ticket entrance while staying here. Even it has its own Disney store to buy your tickets and merchandise in advance. The shuttle to all Disney theme parks are all easy to get. Love to come back again! The Hilton is a very nice hotel nice size double beds and a great pool area. Large beach towels provided. Bathroom could use less shower space and more vanity room. The bus to disney parks runs on time, but if you miss one its a little bit of a wait. Decent resturants if you don't want to fight the crowds elsewhere. Watch the pricing on your reservation- I booked it and then the price went down.Front desk could have had more staff and a place to form a line. It was not orchestrated well. close to highway entry and exit point, close to disney downtown, spacious rooms.